Facebook helps people feel connected, but it doesn't necessarily make them happier, a new study shows. Facebook use actually predicts declines in a user's well-being, according to a University of Michigan study that is the first known published research examining Facebook influence on happiness and satisfaction. The study about the use of Facebook, a free networking website, appears online in PLOS ONE. "On the surface, Facebook provides an invaluable resource for fulfilling the basic human need for social connection," said U-M social psychologist Ethan Kross, lead author of the article and a faculty associate at the U-M Institute for Social Research (ISR). "But rather than enhance well-being, we found that Facebook use predicts the opposite result – it undermines it." "This is a result of critical importance because it goes to the very heart of the influence that social networks may have on people's lives," said U-M cognitive neuroscientist John Jonides, another author of the paper. For the study, the researchers recruited 82 young adults, a core Facebook user demographic. All of them had smart phones and Facebook accounts. They used experience-sampling—one of the most reliable techniques for measuring how people think, feel, and behave moment-to-moment in their daily lives—to assess their subjective well-being by texting them at random times five times a day for two weeks. They also found no evidence for two alternative possible explanations for the finding that Facebook undermines happiness. People were not more likely to use Facebook when they felt bad. 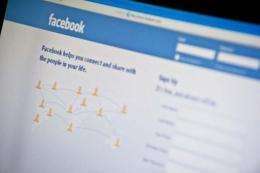 In addition, although people were more likely to use Facebook when they were lonely, loneliness and Facebook use both independently predicted how happy participants subsequently felt. "Thus, it was not the case that Facebook use served as a proxy for feeling bad or lonely," Kross said. "This is the advantage of studying Facebook use and well-being as dynamic processes that unfold over time", said emotion researcher Philippe Verduyn, another co-author of the article and post-doctoral fellow of the Research Foundation - Flanders (Belgium). "It allows us to draw inferences about the likely causal sequence of Facebook use and well-being." Proves that facebook demonstrates how stupid and childish your friends really are. That is a depressing realization. I suspect that there is a quantum wavefunction that allows beings to entangle and become an irreducible whole. Quantum pseudoscience: the BS that collapses as soon as you observe it! Some peculiar aspect of Facebook or some shared attribute of social network sites in general?